Helios & Matheson Analytics, announced Tuesday its plan to make MoviePass a separate public company listed on the US market. The company said it’s considering distributing some common shares of MoviePass Entertainment as a dividend to stockholders of the parent company. Shares surged as much as 50% to $US0.025 apiece on the news. Watch Helios and Matheson Analytics trade in real time here. 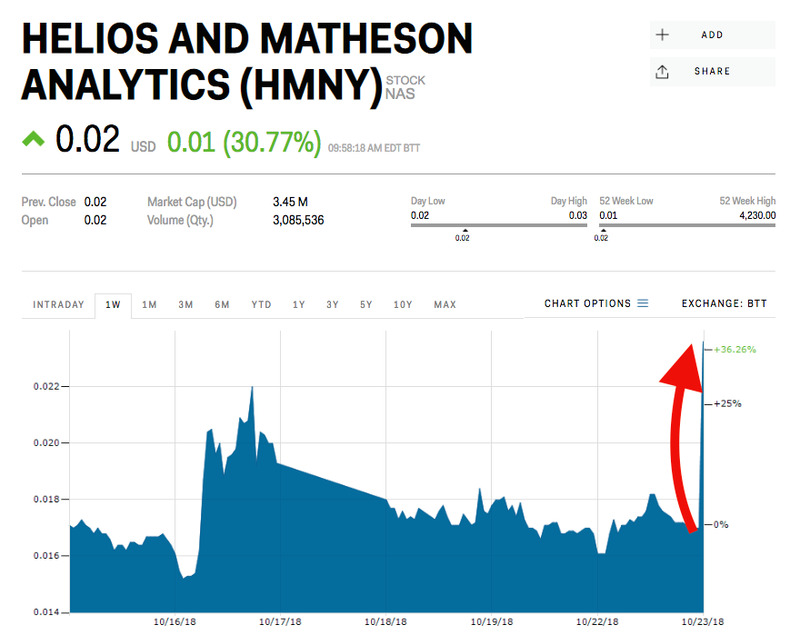 Shares of Helios & Matheson Analytics, the owner of MoviePass, exploded by as much as 50% to $US0.025 apiece Tuesday after the company announced its plans to spin-off MoviePass and make it a separate public company. The parent company announced that its board of directors has preliminarily approved a plan to create a new subsidiary,MoviePass Entertainment, that would take ownership of the shares of MoviePass and its other film-related assets. The new unit will be a vertically integrated film production, marketing, and exhibition company. The company also said it is considering distributing a minority of the outstanding shares of MoviePass Entertainment common stock as a dividend to stockholders of Helios & Matheson Analytics. MoviePass will be listed on Nasdaq or an alternate trading market if the branch can satisfy the applicable initial listing criteria of the applicable exchange or trading market, Helios & Matheson Analytics added. “Since we acquired control of MoviePass in December 2017, Helios and Matheson Analytics largely has become synonymous with MoviePass in the public’s eye, leading us to believe that our shareholders and the market perception of HMNY might benefit from separating our movie-related assets from the rest of our company,” CEO Ted Farnsworth said in a press release. The announcement came six days after the New York Attorney General launched an investigation into whether Helios & Matheson Analytics misled investors regarding its financials. The company has denied any wrongdoing. Business Insider reported in August that Helios & Matheson had covered hundreds of millions in losses by selling millions of new shares of stock to shareholders, and that Farnsworth had made several promises to investors at a July shareholders meeting that began to unravel soon after. Helios & Matheson shares have dropped nearly 100% this year. Nathan McAlone and Travis Clark contributed to this story.